The addition of long-lasting pavers is a simple, low-maintenance way to enhance residential or commercial landscaping. Besides the utility of providing clean driveways and walkways, landscape pavers can be used in many ways to beautify an outdoor area. Some of the most popular applications are outdoor kitchens, pool and hot tub decking, entryways, and patios. Pavers are extremely flexible landscaping materials. They are available in a variety of materials, colors, patterns, shapes and finishes. Whether one chooses stone, brick or concrete pavers, the options for unique design are endless. Pavers lend themselves to all styles of architecture, from the classic charm of Victorian, to Southwestern, clean lines. Pavers can be laid in a formal pattern or a loose, informal style. Usage and locale make some paver types more suitable for the project than others, so it is important to consult with an experienced landscaper, such as Jeff's Landscaping & Yard Service before embarking on any paver project. The most economic paver is brick. It is also the most popular paver. Brick lends itself well to high traffic walkways and driveways. The many colors, designs and shapes available in brick make it an extremely versatile choice for any paving application. 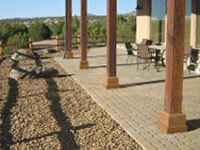 Concrete pavers are also available in many designs, shapes and colors. These pavers can be formed to make "cobblestones", interlocking geometric shapes as well as standard square, rounded and rectangular forms. 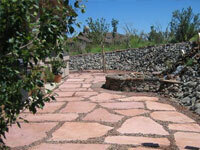 Flagstone, mined near Chino Valley, is a wonderful and economic natural stone choice for Yavapai County residents. Pink, green, gold, and rust are just a few of the endless color selections available in local flagstone. Flagstones can be purchased in different thicknesses and sizes. The irregular shape of the stone gives an organic look to any outdoor landscape application. View some examples of pavers we have installed. 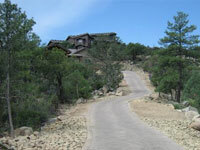 Jeff's Landscaping & Yard Service has the experience of installing landscape pavers in the Prescott area. Please call the owner, Jeff Barter, when you are ready to add pavers to your landscaping. Jeff's Landscaping & Yard Service can be contacted toll-free at (877) 820-0863 or Request a Quote directly from our website.